Ha ha… in writing distance just then it came out dustance, which is probably how most kiwi’s would say it. Today was basically just about making it to Taurmarunui and walking the remaining 20km along the road. I set the alarm early but decided a sleep in was called for once it went off. I slept really well on my bed of ferns fronds. Packing up camp I saw the US crew of Princess, Disco and Skitles walk by along the road. If I was ready to go right then and there I would have called out and walked with them but I still had a bit to do and hadn’t finished breakfast. I was on the road by 7am. My biggest concern for the day was water. Dry camping last night I needed what I had remaining for the 20km day ahead. I had about 500ml. There are numerous creeks running under the road through this section but they all run through farmland and I’m never prepared to drink from them. As luck would have it, like on so many occasions on this trip, around 6 kilometres in I stumbled on Sam’s Shop. Sam is an eleven year old local kid that on seeing all these strange people wander past his house each day in summer, found that they were walking Te Araroa and came from all around the world. He was curious to know where they all came from and set about constructing his own trail magic water stop for the trampers. 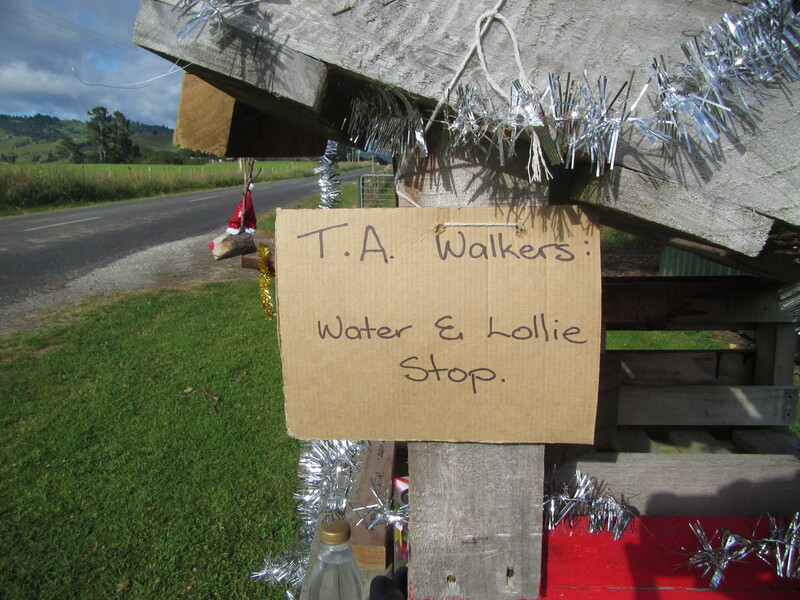 Sam has set up a stall out the house on the road side with a log book for trampers to record where they are from and offering fresh, clean drinking water and lollies for trampers. Perfect! Great job young man and very much appreciated by all the trampers who stop by. Continuing on the road I caught up with the US crew as they took a break under the shade of a conifer tree and we played leap frog along the road for a bit. We caught up again in town at the first establishment offering food. In this case I couldn’t have been more pleased. There is nothing wrong with scoffing a large pizza at 11am is there? I then headed looking for accommodation for rhe night. Most trampers hole up in the holiday park but it is 3km out of town. I have a bounce box to pick up and a package with new shoes and really didn’t feel like continually running back and forth the 3km in/out of town. I opted for a cheap motel and they looked after me at TA rates for 2 nights. They even did my dirty, stinking laundry for free! The post office is a block to the left and the supermarket a block north. Cafes and takeaway galore close by. The perfect spot fir a rest day really. With my bounce bix collected from the post, I didn’t muck around preparing for the next leg. It’s a few days off Christmas and I wanted to see if I could jump on board a kayak trip down the Whanganui River on Thursday, before everything shuts down over the weekend. I’ll find out tomorrow. For safety readons, the hire companies don’t hire to solo people but the company I called did have 2 other small group bookings departing on Thursday and they are going to make contact with them to see if they don’t mind a tag along. Basically if they don’t mind me tagging on, it means we start together but go at our own pace, i’d be in an individual kayak and we just have to meet up at the same place at the end of the day; that way the kayak company is covered insurance wise. All going well, there both groups of young Swedish backpacking girls named Inga. Yeah right. I wouldn’t know what to do. More than likely groups of oversees tourists at any rate. 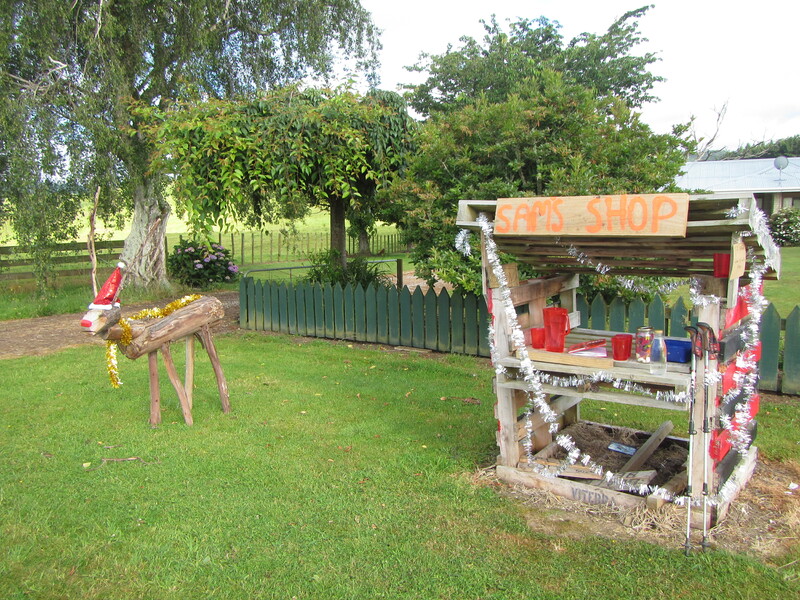 Anyway, it if pays off it looks like Christmas on the Whanganui. Looking forward to being able to carry some heavier, decent food and beer in a kayak, giving my feet a rest for 5 days and letting my arms do the travelling. It should be around 145km of travel down the river, then I’ll yo-yo back north to do the Tongario Crossing. Sam sounds like an enterprising young man. He may do the trek some day in the future. If I don’t hear from you over the next couple of days have a peaceful, scenic kayak along the river, be safe and a VERY MERRY CHRISTMAS maybe with your favourite beer.